Sao Miguel is the largest and most highly populated island in the tranquil Azores archipelago in the heart of the North Atlantic. With a landscape dominated by rolling hills and lush wooded areas, Sao Miguel is referred to locally as ‘the green island’. It is also arguably the most picturesque island in the Azores, boasting a large number of magnificent crater lakes. It also has one of the oldest and largest parks in the archipelago, Terra Nostra. It dates back to the 18th Century and consists of pretty lakes, vibrantly coloured flowers and centuries-old trees. 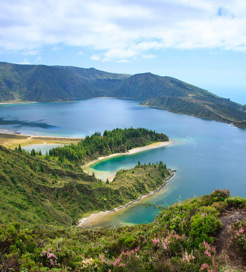 Unlike many of the Azores islands, Sao Miguel’s coastline is blessed with lovely sandy beaches, suitable for both a refreshing swim and an afternoon of sunbathing. Sao Miguel has some great architecture, too. Stroll through the capital, Ponta Delgada to admire its baroque buildings, most notably the Portas da Cidade (City Gates), comprising three large arches built in the 1700s. Looming over the western shoreline of Lake Furnas is the striking Nosa Senhora das Vitorias Chapel, a gothic-style church built in the late 19th Century and the only one of its kind in the Azores. Also, nearby the lake are some of the best natural hot springs on the island. One of the most prominent Azorean traditions is the spectacular Holy Ghost Festival held on each Sunday from April until June. It involves a large procession parading a ‘lucky’ person named empress or emperor for the day through the streets and finishing at the local church where they hold mass. Also not to be missed is the Miracles of Christ Festival in Ponta Delgada on the 5th Sunday after Easter, it involves parading a statue of Christ alongside street booths, fairs and various activities. You can sail to Ponta Delgada on Sao Miguel’s southern coast from the Azores Islands of Faial, Flores, Terceira, Pico, Sao Jorge, Graciosa and Santa Maria. These routes are operated by Atlanticoline who provides a few crossings each week. For more information, please visit our Ferries from Faial to Sao Miguel page. For more information, please visit our Ferries from Flores to Sao Miguel page. For more information, please visit our Ferries from Terceira to Sao Miguel page. For more information, please visit our Ferries from Pico to Sao Miguel page. For more information, please visit our Ferries from Sao Jorge to Sao Miguel page. For more information, please visit our Ferries from Graciosa to Sao Miguel page. For more information, please visit our Ferries from Santa Maria to Sao Miguel page.